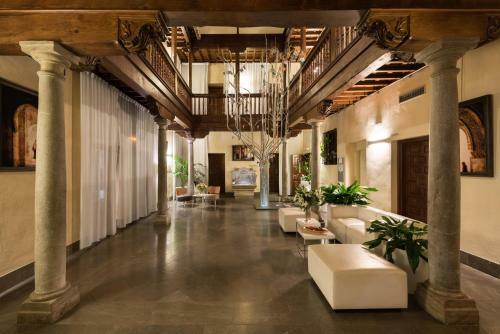 Set in Centro, the Gar-Anat Hotel de Peregrinos is close to Granada Cathedral and offers an express check-in and check-out feature, air conditioning and a jacuzzi. The hotel is a five-minute walk from many attractions including Royal Chapel of Granada and the Madrasah of Granada. The hotel has 15 rooms and has been recently refurbished. The hotel also offers a 24 hour reception, massage services and meeting rooms. The hotel also provides its guests with an airport transfer service. The Gar-Anat Hotel de Peregrinos offers spacious and comfortable rooms equipped with heating, a TV and a hair dryer. A telephone, a private bathroom and a desk with an electrical outlet can be found in each room of the hotel. There are also honeymoon suites available. To make sure your day gets off to a good start, the hotel provides a buffet breakfast each day. For other meals, there are plenty of restaurants and cafés located close by. For those on the move, the hotel provides packed lunches. Located just a stone's throw from a range of popular hot spots, the hotel is near a number of bars, nightclubs and trendy restaurants. Shopping and a vibrant night life are only moments from the hotel's front doors. This hotel is 1119 metres from the Alhambra entrance, 263 metres from Plaza Nueva (the absolute centre of Granada), 1682 metres from the train station and 3182 metres from the bus station.